The stylish, 4K Asus ZenBook Pro UX501 has a design aesthetic and performance that rivals the Apple MacBook Pro for far less scratch. Just beware mediocre battery life, hefty disposition and some shoddy speakers. Like most other premium Ultrabooks, the Asus ZenBook Pro UX501 aims to impress. From both its core specs and sleek visuals, this Asus flagship cuts a striking figure. 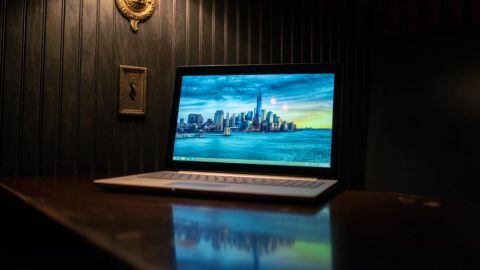 The laptop is a follow-up to last year's ZenBook NX500, and it features a similar aluminum chassis, speedy SSD storage, and a 4K display – all at an attractive starting price of $1,499 (about £967, AU$1,894). On the surface, it would seem that Asus continues to offer the ZenBook Pro UX501 as the PC-lover's alternative to the 15-inch Retina MacBook Pro. That would be in keeping with the NX500's positioning last year, and stays in line with Asus's tendency to offer a value proposition over the competition. Asus has certainly achieved that by packing the UX501 with an Intel Core i7 processor, a 4K touchscreen display and a 512GB SSD. It's a better-equipped triple play package than a comparably sized Apple laptop. Where the UX501 falters is in its performance. While its benchmarks as a whole outpace Ultrabook class models, at 5 pounds, the UX501 is as much intended for your desk as it is your carrybag. Oddly enough, that's a good thing, considering this model stumbled when it came to battery life, falling short of its stated 6 hour estimated battery life. From the outside, the ZenBook Pro UX501 could easily be mistaken for a MacBook: Its brushed aluminum design aesthetic bears more than a passing resemblance. Its made of brushed aluminum, with subtle, concentric circles on the cover (in keeping with other Asus designs). Overall, the build quality feels solid, though I never tested the theory by dropping the laptop. While it's clearly a rectangular slab, the UX501 has a stylish look. The edges are gently rounded, for example, and the inside surface sports chamfered edges that shine in contrast to the matte finish of the keyboard and palmrest. I'd worry about easily scratching these edges, (though I have yet to do so), but they add an elegant touch. While, the palm rest is large and comfortable, I wish that Asus shaved a little off the sides and depth of the laptop to reduce its footprint and weight. The keyboard deck is adorned with a dotted patterning surrounded by silver painted plastic keys. The patterns look attractive, even if their purpose is purely for aesthetics. I dig the keyboard's white backlight illumination, which I can control the brightness via the function keys.The light bleed beneath the keys is minimal, thanks to the design of the UX501's keyboard making it all the less distracting – a frequent complaint I've had with early generation MacBooks. Also, the backlit keyboard will fade away when you're not using the keys. Even without the illumination, the keys are clearly visible with black lettering. The UX501 packs in the usual complement of ports, with three USB 3.0 ports, mini-DisplayPort and HDMI. It lacks an ethernet port, but Asus kindly bundles a USB ethernet adapter. A generously sized touchpad sits centered to the width of the laptop, as opposed to beneath the keyboard's space bar. While this positioning is ideal, since the keyboard does include a full numeric pad, it requires some getting used to. I find the touchpad a tad stiff and not as smooth as on other laptops I've tried. The stiffness is not so much so as to be a deal breaker, but enough that it's noticeable. More challenging is the keyboard itself. My small hands took a while to adjust to the smaller spacing between the keys, resulting in unexpected typos. Annoyingly, the fans kick in when I'm installing apps and downloading content on the laptop. I also find the audio a bit tinny. The audio is softer than expected, too. I need to pump up the volume for a satisfactory listening experience even in a small, closed-off room. Typically, I have the audio at least 75%, and often on some tracks I felt like I had to push it all the way. The loudness of the speakers is directly affected by the surface you use the laptop on. When I was testing the UX501 on a hard surface where the downward firing speakers could reflect sound, it helped make the audio more satisfactory. Placing the laptop on a softer surface (such as a bed, or leaning it on my legs while on the couch), meanwhile, muffles the speakers and hampers the audio quality.